It is fossil energy driven and environmentally unfriendly, most people are aware off and most easy available oil and gas reserves will be depleted the next 20-50 years (Figure 1). 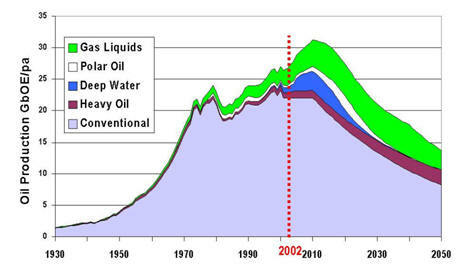 At present world-leaders are choosing according to the International Energy Agency (IEA) for a third great carbon era. By a worldwide cumulative investment of around US $22.87 billion between 2012 and 2035 “The Age of Unconventional Oil and Gas”, a third Carbon driven era will be started. In such a world global carbon emissions will soar far beyond our current worst-case assumptions, diminished food production, our few wilderness areas will be eviscerated and planet Earth will become a harsher and blistering planet. Another more prosperous perspective would according to our foundation be, that we move towards a seaweed based economy (see further). This scenario will permit humanity the 21ste century a smooth transition to a green energy future in which humanity will no longer be pouring carbon dioxide end other greenhouse gases into the atmosphere resulting in “global Earth warming” and “ocean acidification”. This demands an integral international effort to implement innovative energy-smart solutions which are cost effective and also reach the remote areas of our planet were primarily the underdeveloped countries are located and which are the regions were and unfettered growth of the world population will take place. As mentioned earlier our foundation is strongly supportive for a seaweed based economy which is ecological balanced, environmental sustainable and can assist the at present failing terrestrial agricultural system which has the two following major constraints: i). It relies totally on the around 2% freshwater our planet stores; ii) It is to a major extent fossil energy driven (e.g. irrigation water, fertilizer, greenhouses).